Nicotine And Gravy: Beck outs our formerly anonymous but extremely funky food writer. When I first laid eyes on BECK in person, I was still in high school and had the VOLVO for the entire day to go see the TIBETAN FREEDOM CONCERT in San Francisco. That afternoon taught me two valuable lessons: the first is that Beck is a genius, and second is that entrenched militaristic dictatorships are rarely swayed by the earnest pleadings of THE RED HOT CHILI PEPPERS. Though new dictatorship franchises are opening almost every day, and each deserves its own benefit in the park, Beck took the stage for a single reason on July 11: to get down, to get down, to get down all the way. Opening up with CLAP HANDS and BLACK TAMBOURINE, this show was clearly the end result of another DUST BROTHERS-infused mood swing. With bassist DAN ROTHCHILD and drummer MATT SHERROD holding down most of the rhythms, this group was a juggernaut of crunch brought to bear upon our hopelessly not-arena-size Civic Auditorium. The subaudible bass tones and chunky interlocking percussion parts made me want to touch dolphins. 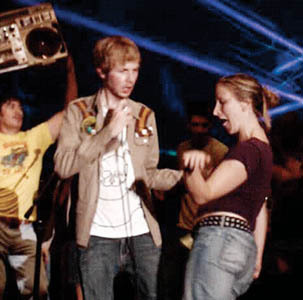 The concert drew heavily from Beck's latest, Guero. Though I am a massive fan of both Odelay and the "damn, I guess it didn't last forever" epic that is Sea Change, Guero is now my favorite set of Beck tunes. Whether it's the "Norwegian '50s singers by the way of Disneyland" break during "Rental Car," the sublimely absurd "Que Onda Guero" or the psychotically catchy "Girl," Beck has made the perfect party record. All these tunes snuck into the set, also with the greatest tune Beck has ever arranged: "Missing." I knew the SHEKERE had a place in alternative rock. There were a few missed sample cues, and should Beck really want to make believe he was playing the banjo in "Sexx Law," then he should not make RIGHT SAID FRED's mistake and plug the damn thing in before chasing Faulkner around the stage. But it's all part of the show, just like the amplified kitchen table set with tuned glasses and resonating plates that the group sat at during the acoustic part of the night. Speaking of which, Beck would like us all to know that he doesn't know "Free Bird" and only halfway knows "Jessie's Girl." He can, however, link up "Satan Bought Me a Taco" with "Lost Cause." Who knew that both the silly and the sad could both be expressed in the same minor key? The giant boombox that descended from the ceiling during "Where It's At" was almost as funny as SPINAL TAP's 1-foot-tall rune. Oddly enough, the cardboard incarnation of a giant beatbox went well with the skinny man-child at center stage, dressed in a Boy Scout uniform and singing about VERSACE jeans while doing the slide. By the time the evening was winding up with a rendition of "Nicotine and Gravy" mixed with a dash of "I Want to Take You Higher," about 50 locals got to mount the stage to let it all hang loose. Risking both her anonymity and the jealous reaction of the entire town, one of Metro Santa Cruz's food writers, ZOE ELIZABETH, managed to snag a dance with the man himself. In the words of Beck's Idaho-based heir to the throne in the realm of geekery, "Lucky!" From the July 20-27, 2005 issue of Metro Santa Cruz.